Up to now, those in the market for a color inkjet all-in-one typically had to choose between a number of desired key features. Typically, the more features that a machine offers the bulkier the machine. The smaller machine the fewer features, plus low cost printing was not always part of the overall package. The introduction of the Business Smart Series means users dont have to compromise on features. Through a total redesign process and innovative landscape printing technology this new series delivers the ultimate combination of productivity, ease of use, low cost printing and professional high impact printing capability, all in a compact size and stylish design. The Ultimate Combination...Everything a business user wants and needs in an all-in-one. Save up to 40% lower black cost per page and help reduce your printing costs with the LC 105 / LC107 XXL Series Super High-Yield Ink Cartridges. Plus, we offer a 4-cartridge ink system that means you only have to change the color that needs to be replaced instead of having to discard an entire set of ink cartridges. The MFC-J4410DW has a simplified control panel that makes it easy to navigate menus on the 1.8 inch TouchScreen display. In addition, users have the ability to customize settings on the home screens and to also create custom shortcuts to access frequently used settings with a touch of a button and to help increase productivity. In developing the Business Smart Series, Brother sought to create a product that would leave our customers without the need to compromise on features or design. This led to a complete redesign of the machine with the introduction of a new innovation technology called Landscape Print Technology, which allows paper to be stored and fed into the machine in a landscape orientation that helps to reduce the size of the machine. 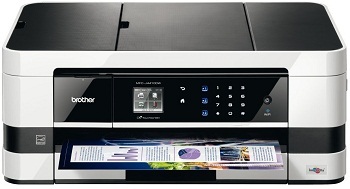 This unique technology allowed Brother to deliver the Ultimate Combination of features in a machine with a compact and sleek design that is up to 35% smaller footprint than the competitors. The MFC-J4410DW also offers powerful business features to help enhance functionality and maximize productivity. Advanced Paper Handling. The MFC-J4410DW has a convenient auto document feeder to easily copy/scan and fax hands-free, plus a 150-sheet capacity paper tray for higher volume printing. Save paper with built-in 2-sided printing. Automatic 2-sided printing allows you to easily create 2-sided (duplex) documents up to 8.5 x 11 inches to help reduce printing costs. Wireless, Wired and Ethernet network. Utilize the power of your wireless network while reducing the number of cables in your home or small office. Easy-to-set up wireless networking enables others to share the MFC on the network without the clutter of cables. MFC-J4410DW is 802.11b/g/n certified and is compatible with most new routers with n technology, allowing for faster data transfer between your PC and printer router. Convenient Mobile Device Printing. The MFC-J4410DW supports wireless printing from your mobile device via4: AirPrint, Google Cloud Print, Brother iPrint & Scan, Cortado Workplace and Wi-Fi Direct (allowing a user to print wirelessly from PC or mobile devices without the need for a router). Access Popular Web Apps Directly from Your Machine. Access your favorite popular web services directly from the TouchScreen LCD Display. This interface enables the user to upload and / or download files to specific web services using an Internet connected Brother MFC without using a computer. Access your FACEBOOK, PICASA Web Albums, FLICKR, EVERNOTE and Dropbox.